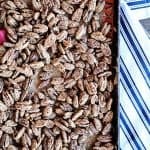 Candied Maple Pecans are sweet, cinnamon spiced, maple glazed whole pecans that are delicious popped out of hand and straight into your mouth, but they’re also on fabulous on salads, in trail mix, and crumbled onto oatmeal or ice cream. My 16 year old said, “They taste like nuttier Cinnamon Toast Crunch!” Read on to find out what our secret ingredient is to make these a little extra wonderful. They’re so easy to make, too, that you’ll never need to buy glazed or candied nuts at the store again! Many years ago, I made cinnamon maple candied almonds and they were wonderful. We ate them hand over fist. And then I forgot about their existence until I found I had two bags of whole pecans that needed to be used and it occurred to me that they might benefit from the same crispy, sweet, fragrant cinnamon and maple treatment. But I thought it might be nice if I added a little something special to these Maple Candied Pecans in the form of a wee pinch of cayenne pepper and boy was I ever right. The barest hint of cayenne in these Candied Maple Pecans is just enough to heighten the maple sweetness without being enough to even really identify that there’s hot pepper hiding in the crisp candy coating. 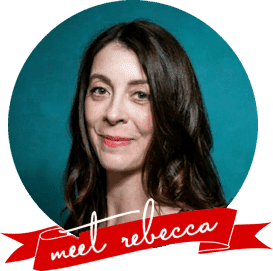 The little hint of salt whisked into the sugar keeps the pecans from being cloyingly sweet and makes the finished candied pecans equally at home as a just-sweet-enough snack that packs a protein punch, on top of dessert, or on a salad. My 16 year old son -who is a little lukewarm when it comes to nuts as snacks- declared them to be delicious and said, “These taste just like a nuttier, better Cinnamon Toast Crunch!” From him, this is high praise. I like to use a large metal mixing bowl for whisking the egg whites to frothiness. That leaves me lots of room to manoeuvre once I start adding in other ingredients. You don’t need to take the egg whites to any kinds of peaks, but you do want them to be very frothy. I like to use a tiny whisk for this because I find it most efficient, but any standard whisk should work. A word on maple syrup: I always prefer Grade B extra dark. If you have it on hand, it lends an extra maple punch to the finished nuts. 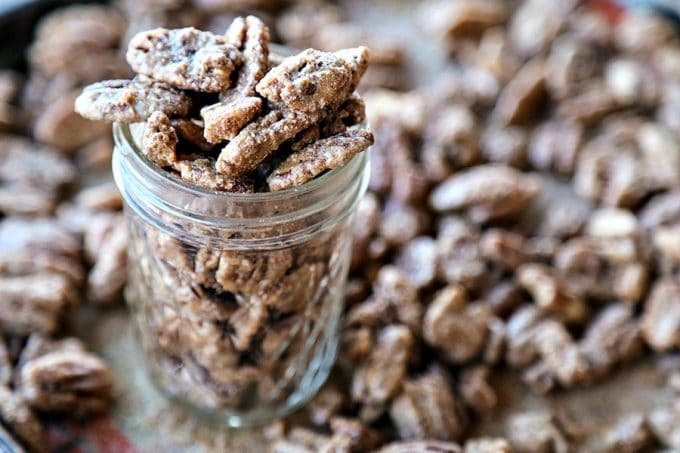 If you only have Grade A, still make Maple Candied Pecans, they’ll still be delicious! When it comes to the sugar you use to make cinnamon sugar to toss with the nuts, my favourite is maple sugar, but raw sugar/turbinado sugar or granulated white sugar works equally well. 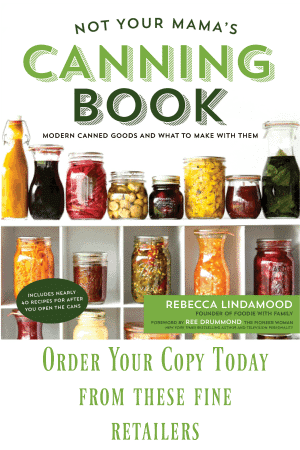 Choose what your personal preference, budget, and pantry dictate. 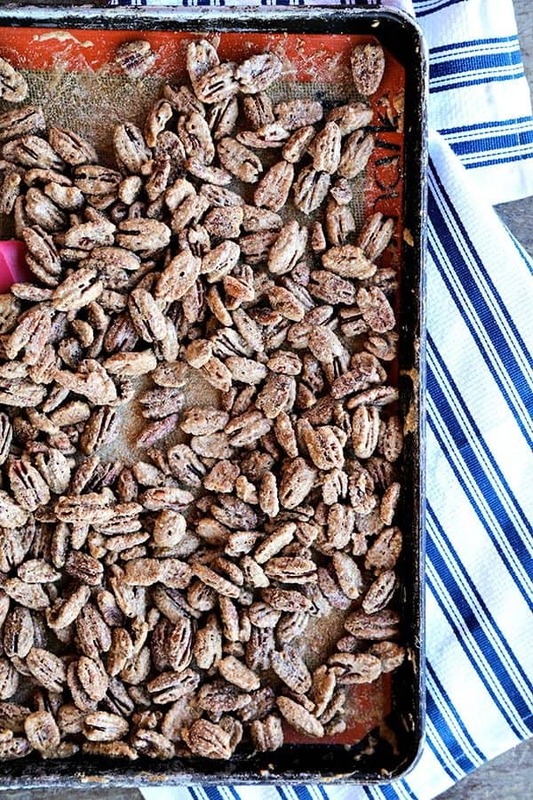 Watch the maple pecans carefully when they’re in the oven. Be sure to stir them at least every 15 minutes -maybe more frequently after the 40 minute mark- baking for about 45 minutes, or until the glaze is dried around the nuts. They’ll look a little chalky if you used maple sugar, but that just means they’re toasted, done, and delicious. Candied Maple Pecans: Whole pecans candied with real maple syrup, fragrant cinnamon, and just the barest hint of spice and salt. Great for snacking, salads, and top of yogurt, ice cream, or oatmeal. In a small bowl, mix the sugar, cinnamon, salt, and cayenne pepper together with a fork until it is evenly mixed. In a large mixing bowl, whisk the egg whites until very frothy. Whisk in the maple syrup until it is evenly mixed. Toss in the pecans until they are completely coated with the egg/maple syrup mixture. Sprinkle the cinnamon sugar over the top and toss again to coat evenly. Spread the nuts in a single layer on the silpat or sprayed parchment lined sheet. Bake the nuts for 45 minutes to 1 hour, stirring every 15 minutes, until the nuts are dry to the touch. Let them cool to room temperature, stirring occasionally to break them up. When they are completely cooled, transfer them to airtight containers -like mason jars- and store at room temperature for up to a month. Serve as a stand-alone snack, or with dried fruit or as a garnish on salads. These are also excellent over ice cream or yogurt. 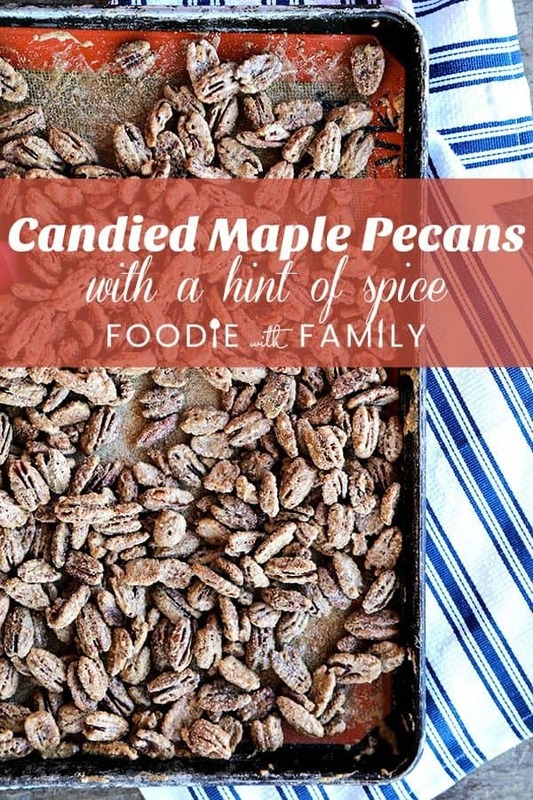 Do you love Candied Maple Pecans? Check out these other cinnamon spiced goodies! Ohhhh a maple version!! Can’t wait to try it! I love the maple here! We have lovely pecans here in Oklahoma. Think I will pick some up today at noon (I already have one bag) and try this. I wonder if adding a quarter teaspoon or so of maple extract would help the flavor, as I do not have Grade B syrup? I have just a little maple sugar left, so I will mix that with some turbinado. Thanks for a fab recipe. Bet these will be great on a salad with an orange vinaigrette. Oh my goodness! Fresh pecans sound like pure luxury to me! <3 I think a turbinado maple combo sounds lovely and I'm with you on that salad!